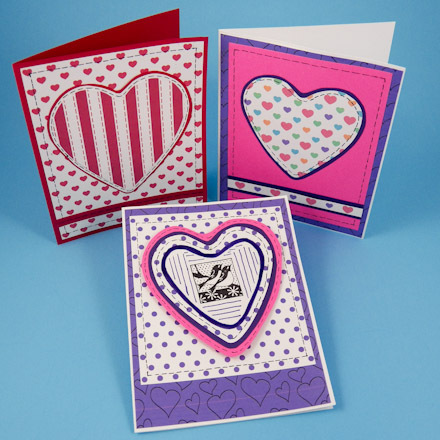 These Valentine's Day cards feature paper heart appliqués made with patterned papers that you can download and print. 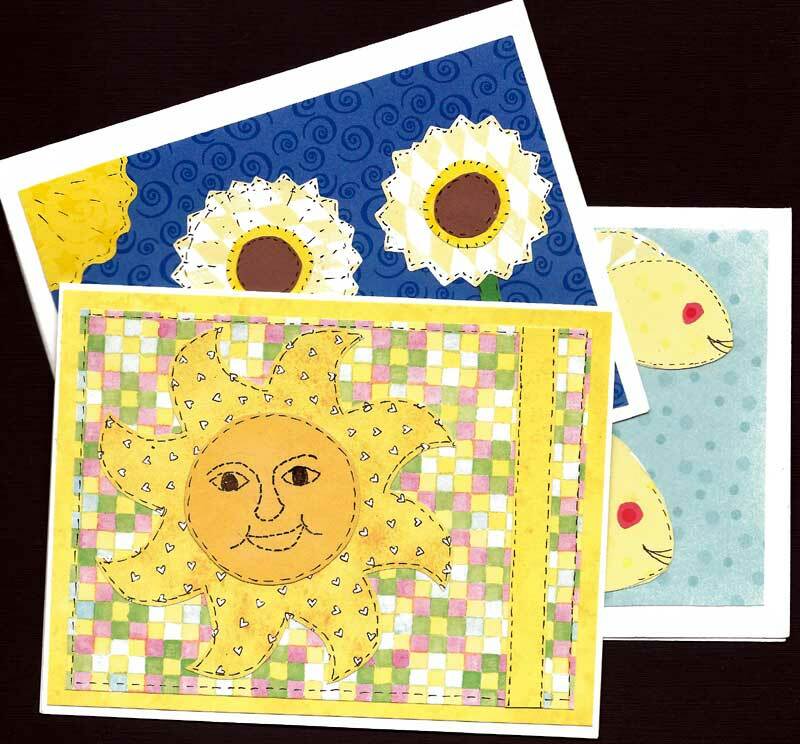 The paper appliqués on these greeting cards are made to resemble fabric appliqué (cut cloth and embroidery often used as embellishment on clothing and quilts). The technique of decorating greeting cards with paper appliqué is featured in the Paper Appliqué Cards tutorial from Aunt Annie's Greeting Card Class. See this tutorial for detailed instructions, and if you are new to card making, review the Greeting Card Class tutorials for ideas and basic techniques. For how to make card blanks and envelopes, see the Four Patch Cards tutorial or see the Envelopes to Make craft project for envelope templates and instructions. Scroll down to see the instructions for all five card options. All the card options use digital paper that you download and print on white paper. 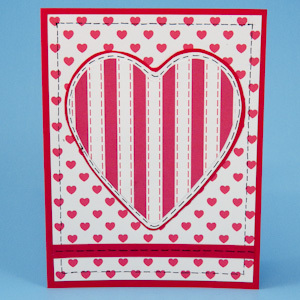 The last card, Striped Valentine Appliqué, is made exclusively of decorative digital paper and white cardstock. 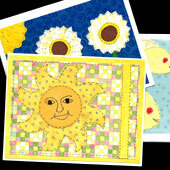 All of the other cards use the decorative digital papers in combination with colored paper or cardstock. Prep work: Cut a rectangle of Little Red Hearts slightly smaller than the card front. Cut a 3" heart of Red Stitched Stripes. Glue the heart to white paper or cardstock and trim to a 1/8" border. 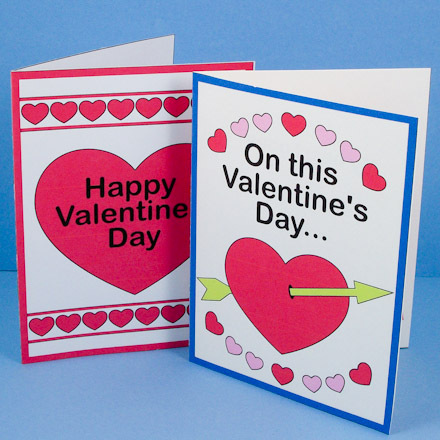 Glue the matted heart to red cardstock and trim to a narrow border. Cut a 4" by ¼" strip of red cardstock. Faux stitching: Use a fine-tip black marker to make a dashed line around the heart and the red heart rectangle to resemble a running stitch. Also make stitch marks down the center of the red strip. 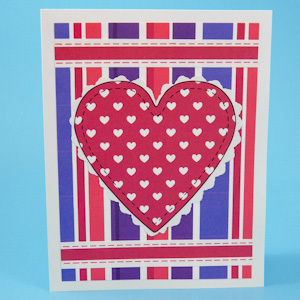 To assemble card: Glue the red strip and matted heart to the red heart rectangle as pictured above. Trim the strip to the width of the rectangle. Glue the rectangle to the red card front. Prep work: Cut a rectangle of Pen 'n Ink Hearts on Lavender slightly smaller than the card front and a rectangle of bright pink that's another ½" smaller in both dimensions. Cut a 3" heart of Pastel Hearts and a 4" strip of pink and purple hearts from the Pastel Hearts paper. Glue the heart to purple paper or cardstock and trim to a 1/8" border. Cut a 4" by ½" strip of purple paper or cardstock and glue the strip of hearts to it. Faux stitching: Use a fine-tip black marker to make a dashed line around the heart and the pink rectangle to resemble a running stitch. To assemble card: Glue the strip of hearts and matted heart to the pink rectangle as pictured above. Trim the strip to the width of the pink rectangle. 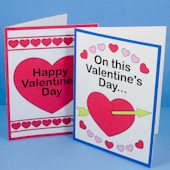 Glue the pink rectangle to the Pen 'n Ink Hearts on Lavender rectangle, and then glue that to the card front. Prep work: Cut a rectangle of Pen 'n Ink Hearts on Lavender slightly smaller than the card front and a 3¾" by 4¼" rectangle of Purple Polka Dots. Cut a 3" heart of Purple Polka Dots. 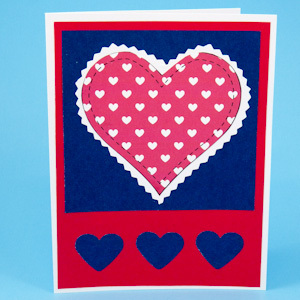 Cut a heart from white cardstock that is ½" smaller than the purple dotted heart. 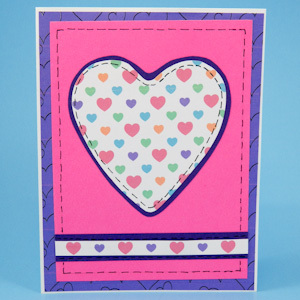 Glue the purple dotted heart to purple paper or cardstock and trim to a 1/8" border. 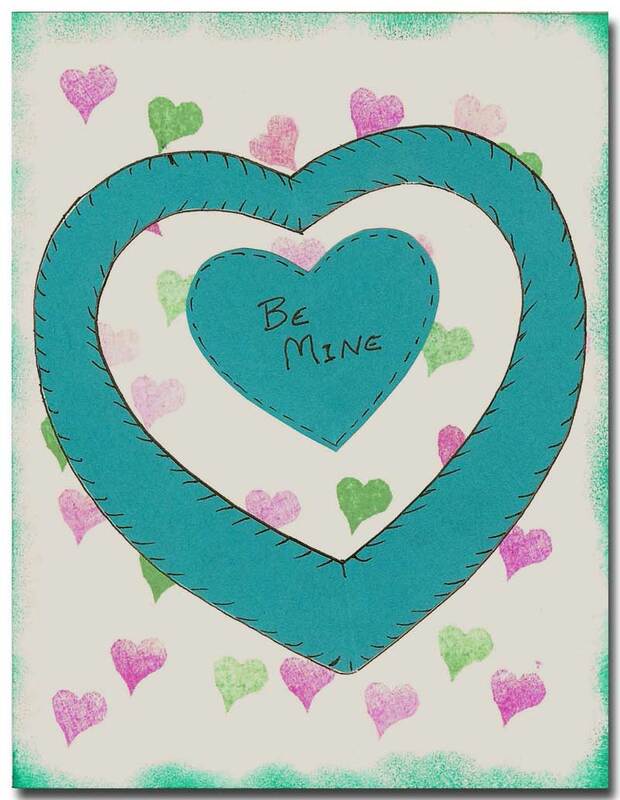 Glue the matted heart to bright pink paper or cardstock and trim to a ¼" border. Stamp the white heart with a 1" rubber stamp of your choosing, and fill the space around the stamped image with lines drawn using the purple marker. Faux stitching: Use a fine-tip black marker to make a dashed line around the purple dotted rectangle and the heart to resemble a running stitch. Make two rounds of stitch marks on the heart—on the purple dots and on the bright pink. To assemble card: Glue the matted heart to the purple dotted rectangle as pictured above. 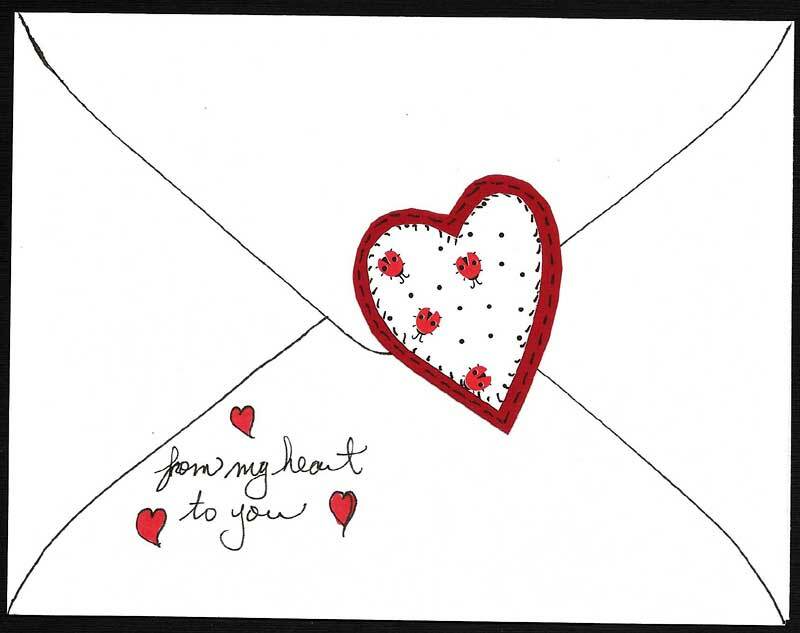 Glue the purple dotted rectangle to the Pen 'n Ink Hearts on Lavender rectangle, and then glue that to the card front. Prep work: Cut a rectangle of red paper or cardstock slightly smaller than the card front and a 3¾" square of dark blue paper or cardstock. Punch three 1" hearts from the dark blue. Print the Heart appliqué templates pattern on the front of the sheet of Little white hearts ePaper. Cutout one of the appliqué hearts. Glue the appliqué heart to white cardstock and trim to a ¼" border with the decorative-edge scissors. Tip: First cut with regular scissors to a ½" border, then trim to ¼" border with the decorative-edge scissors. Faux stitching: The printed heart appliqué already has "stitch" marks. If you like, add more stitch marks to the red and blue paper using a fine-tip black marker. To assemble card: Glue the matted heart to the dark blue square as pictured above. Glue the dark blue square to the red rectangle, and then glue that to the card front. Glue the three 1" hearts in a row below the large heart. Prep work: Cut a rectangle of Valentine's Day Stripes slightly smaller than the card front and two 4" stripes from Red Stitched Stripes. Print the Heart appliqué templates pattern on the front of the sheet of Little white hearts ePaper. Cut out one of the appliqué hearts. Glue the appliqué heart to white cardstock and trim to a ¼" border with the decorative-edge scissors. Tip: First cut with regular scissors to a ½" border, then trim to ¼" border with the decorative-edge scissors. Faux stitching: The printed heart appliqué and the stripes already have "stitch" marks. If you like, add more stitch marks using a fine-tip black marker. To assemble card: Glue the stripe strips and the matted heart to the striped background as pictured above, and glue that to the card front. Related crafts: Want more card ideas? 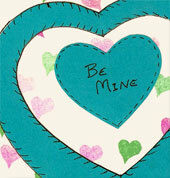 Check out the Valentine's Day Cards page to find the perfect handmade card project. 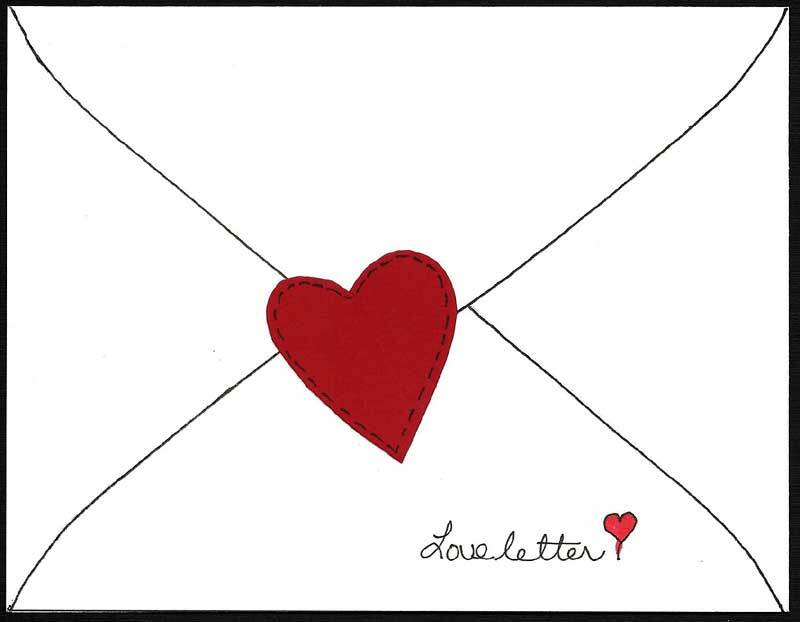 Tip: Make a simple love letter card by drawing lines on a white card blank that resemble a sealed envelope, and adding an appliqué heart. Tip: "Stitch" the appliqué with a faux blanket stitch. Pattern: To use as a traceable template, print the heart appliqué templates on cardstock and cut out. Or print the templates directly on colored or patterned paper. Related project: These cards use the paper appliqué technique featured in the Paper Appliqué Cards tutorial from Aunt Annie's Greeting Card Class. See this tutorial for detailed instructions.